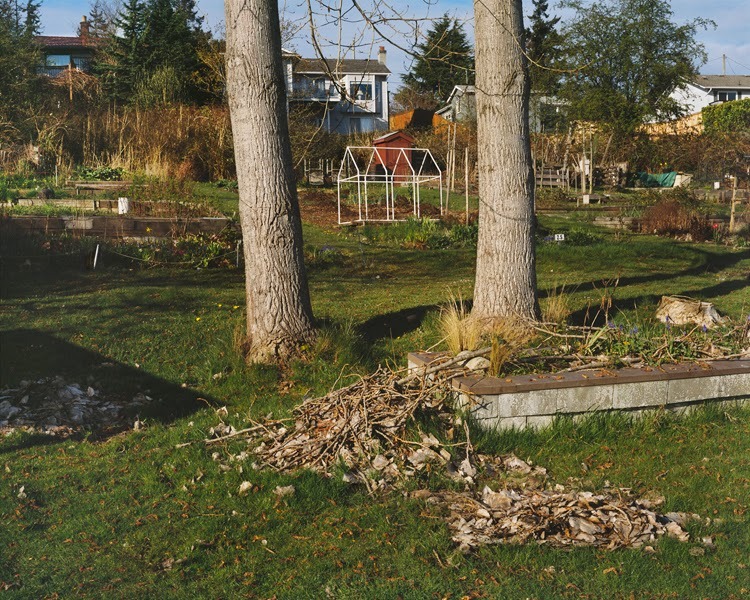 fototazo: The Image: David Pollock, from the series "Enclosure"
The Image: David Pollock, from the series "Enclosure"
This photograph is one of a series of pictures made in a large community garden near Victoria, Canada, between 2011 and 2012. What first attracted my attention to the landscape in this picture was the linear and illusionistic quality of the house-like structure forming a central element within the frame. This image connects to an earlier one of wire edging resembling a child-like drawing of a row of houses. I responded to its flat illustrative quality which shows the house as a sheltered place or enclosure with the decaying leaves in the foreground acting in opposition to this bright white representation. While composing the picture, I became aware of the rounded lamp in the window at the top of the frame, and included this element as a kind of beacon of security. I photographed this scene twice: once when it was bathed in sunlight, and the other under an overcast sky. I chose the sunlit landscape, which deepens perspective in the image. I rarely make pictures that involve looking through objects and prefer what appears to be a less directed composition. In this case, I see the tree trunks and window as framing devices that reinforce the content of the picture. In retrospect, I have come to see the structure as fragile and impermanent, like the fate of the decomposing leaves spread out in foreground.